An earthquake is the shaking or trembling of the earth’s surface, caused by the sudden movement of a part of the earth’s crust. They result from the sudden release of energy in the Earth’s crust that creates seismic waves or earthquake waves. About 50,000 earthquakes large enough to be noticed without the aid of instruments occur annually over the entire Earth. Of these, approximately 100 are of sufficient size to produce substantial damage if their centers are near areas of habitation. Most earthquakes are causally related to compressional or tensional stresses built up at the margins of the huge moving lithospheric plates. The immediate cause of most shallow earthquakes is the sudden release of stress along a fault, or fracture in the earth’s crust. Sudden slipping of rock formations along faults and fractures in the earth’s crust happen due to constant change in volume and density of rocks due to intense temperature and pressure in the earth’s interior. Volcanic activity also can cause an earthquake but the earthquakes of volcanic origin are generally less severe and more limited in extent than those caused by fracturing of the earth’s crust. Earthquakes occur most often along geologic faults, narrow zones where rock masses move in relation to one another. The major fault lines of the world are located at the fringes of the huge tectonic plates that make up Earth’s crust. Plate tectonics: Slipping of land along the fault line along, convergent, divergent and transform boundaries cause earthquakes. Example: San Andreas Fault is a transform fault where Pacific plate and North American plate move horizontally relative to each other causing earthquakes along the fault lines. 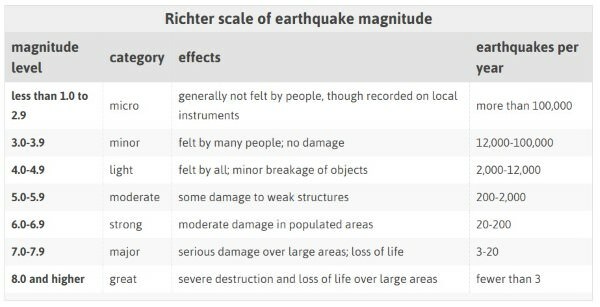 Some earthquakes are human induced. Earthquakes in the reservoir region, mining sites etc. are human induced. In fluid injection, the slip is thought to be induced by premature release of elastic strain, as in the case of tectonic earthquakes, after fault surfaces are lubricated by the liquid. A separate type of earthquake is associated with volcanic activity and is called a volcanic earthquake. Yet it is likely that even in such cases the disturbance is the result of a sudden slip of rock masses adjacent to the volcano and the consequent release of elastic strain energy. The stored energy, however, may in part be of hydrodynamic origin due to heat provided by magma moving in reservoirs beneath the volcano or to the release of gas under pressure. There is a clear correspondence between the geographic distribution of volcanoes and major earthquakes, particularly in the Circum-Pacific Belt and along oceanic ridges. Volcanic vents, however, are generally several hundred kilometres from the epicenters of most major shallow earthquakes, and many earthquake sources occur nowhere near active volcanoes. Even in cases where an earthquake’s focus occurs directly below structures marked by volcanic vents, there is probably no immediate causal connection between the two activities; most likely both are the result of the same tectonic processes. The slipping of land generates seismic waves and these waves travel in all directions. Body waves are generated due to the release of energy at the focus and move in all directions travelling through the body of the earth. Hence, the name body waves. The body waves interact with the surface rocks and generate new set of waves called surface waves. These waves move along the surface. The velocity of waves changes as they travel through materials with different elasticity (stiffness) (Generally density with few exceptions). The more elastic the material is, the higher is the velocity. Their direction also changes as they reflect or refract when coming across materials with different densities. There are two types of body waves. They are called P and S-waves. Also called as the longitudinal or compressional waves. Particles of the medium vibrate along the direction of propagation of the wave. P-waves move faster and are the first to arrive at the surface. These waves are of high frequency. They can travel in all mediums. Velocity of P waves in Solids > Liquids > Gases. Their velocity depends on shear strength or elasticity of the material. Also called as transverse or distortional waves. Analogous to water ripples or light waves. S-waves arrive at the surface with some time lag. A secondary wave cannot pass through liquids or gases. These waves are of high frequency waves. Travel at varying velocities (proportional to shear strength) through the solid part of the Earth’s crust, mantle. Also called as long period waves. They are low frequency, long wavelength, and transverse vibration. Generally affect the surface of the Earth only and die out at smaller depth. Develop in the immediate neighborhood of the epicenter. They cause displacement of rocks, and hence, the collapse of structures occurs. These waves are the most destructive. Recoded last on the seismograph. Wadati Benioff zone is a zone of subduction along which earthquakes are common. 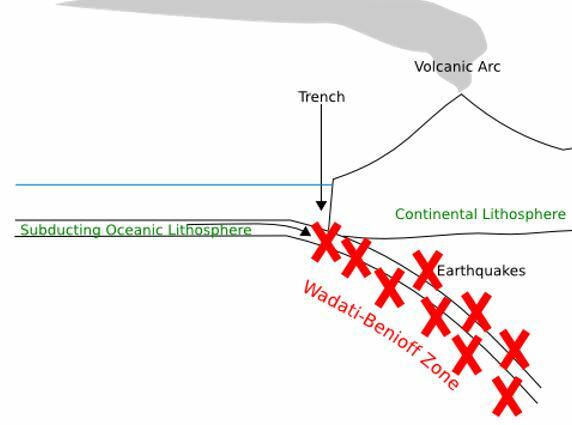 A Wadati–Benioff zone is a zone of seismicity corresponding with the down-going slab in a subduction zone (Convergent Boundary). Differential motion along the zone produces numerous earthquakes. Deep focus earthquakes (Occurs at trenches – convergent boundary. Very powerful. Japan lies along trench line. Hence it faces devastating earthquakes). Shallow focus earthquakes are called crustal earthquakes as they exist in the earth’s crustal layer. Deep focus earthquakes are known as intra plate earthquakes, as they are triggered off by collision between plates. Shallow-focus earthquakes occur at depths less than 70 km, while deep-focus earthquakes occur at greater focal depths of 300 – 700 km. 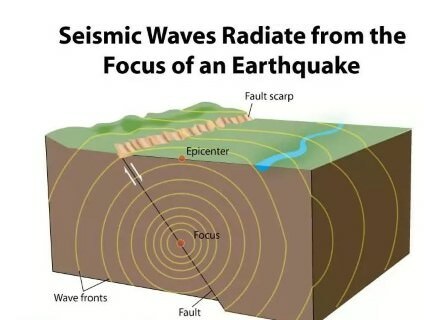 Shallow focus earthquakes are found within the earth’s outer crustal layer, while deep focus earthquakes occur within the deeper subduction zones of the earth. Shallow focus earthquakes are of smaller magnitudes, of a range 1 to 5, while deep focus earthquakes are of higher magnitudes, 6 to 8 or more. Earth’s major earthquakes occur mainly in belts coinciding with the margins of tectonic plates. The most important earthquake belt is the Circum-Pacific Belt, which affects many populated coastal regions around the Pacific Ocean—for example, those of New Zealand, New Guinea, Japan, the Aleutian Islands, Alaska, and the western coasts of North and South America. The seismic activity is by no means uniform throughout the belt, and there are a number of branches at various points. 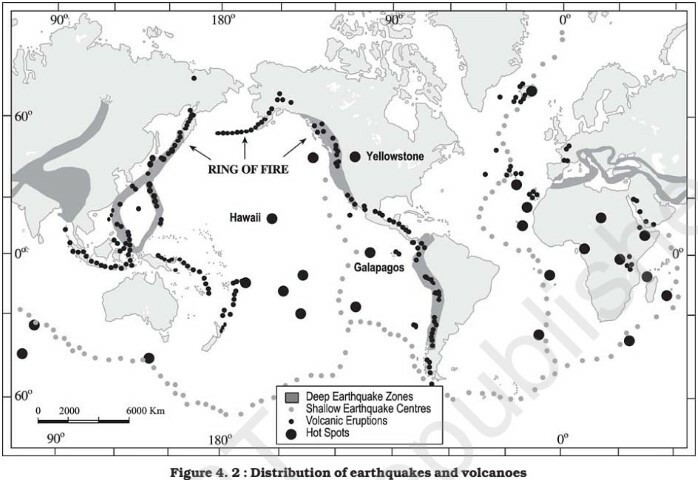 Because at many places the Circum-Pacific Belt is associated with volcanic activity, it has been popularly dubbed the “Pacific Ring of Fire.” The Pacific Ring of Fire accounts for about 68 per cent of all earthquakes. A second belt, known as the Alpine Belt (Himalayas and Alps). The energy released in earthquakes from this belt is about 15 percent of the world total. The mid-world mountain belt (Alpine Belt) extends parallel to the equator from Mexico across the Atlantic Ocean, the Mediterranean Sea from Alpine-Caucasus ranges’ to the Caspian, Himalayan mountains and the adjoining lands. This zone has folded mountains, large depressions and active volcanoes. There also are striking connected belts of seismic activity, mainly along oceanic ridges—including those in the Arctic Ocean, the Atlantic Ocean, and the western Indian Ocean—and along the rift valleys of East Africa. Earthquakes cause landslides, damming of rivers, depressions which form lakes. They can cause submergence and emergence of landforms along coastal regions. Example: Coastline of Kutch. Lead to change in surface drainage and underground circulation of water. More devastating features of earthquakes are fires and seismic waves (tsunamis). Formation of cracks or fissures especially in the region of the epicenter is common.